Q: Name a well-known TV actress of the past. Put an R between her first and last names. Then read the result backward. The result will be an order Dr. Frankenstein might give to Igor. Who is the actress, and what is the order? We might as well dig up some of our hints from a prior puzzle. Edit: Clues were "dig up" and a reference to a similar puzzle in July. I am sure everyone has heard of that famous TV actress NIA BETH. Sorry, I meant NIA BEHT. I sent in this video: NOTHING IS IMPOSSIBLE with my answer as I thought will might enjoy it! Just goes to show, where there is a Will -- even if one is Shortz-changed by fate -- there is a well, you know. Name a somewhat well-known TV and film actress whose roles date back to the 1980s, and who has a role in a current-release film, as a "Nancy Grace" clone. Put a B between her first and last names. Then read the result backward. The result will what certain artists do? Who is the thespian and what do these artists do? How many artists actually draw bales? I usually do in a strawbale building, partly to make sure my walls end up on module, or when there is a complicated layout, or when specific goals are needed. But architects only like to think they are artists. I'm not sure how many times my boss has given me that particular order. reminds me that long ago I almost did the ordered action, accidentally, which would have had great and ironic literary ramifications. Festus, go get the Marshall. He may want to look into this case. I do not. But, my best friend was a career IRS guy until he got disabled in a car accident. Through him, I've become friends with too many revenuers. I didn’t appreciate Blaine’s clue at first but now I do. Does she have Marty Feldman eyes? I have a hunch that she does. 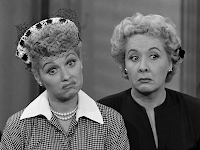 Since Blaine posted a picture of Lucy and Ethel I thought I'd post a link to Tim Gunn's wonderful Vivian Vance story for any NPR fans who haven't heard it yet. Not every woman of the past was a famous actress. I like this better. No offense,, but any YF summary without "he was my ... boyfriend" ... please! And then, there's this. . . It's almost halloween so that means it's time for a puzzle in the scare genre. Time for some of the anti-TV denizens of this blog to exhibit screen rage. I am sorry to report that I am reluctant to express my extreme displeasure with this "new" puzzle offering. Yes it is true that I despise TV since I left home at 18, and have rarely watched since, but you will no doubt agree with me that I have expressed more than my fair share of outrage at WS in last week's blog. Therefor I shall now abstain from further expressing my disgust with Mr. Shortz at this time. I hope you will understand as I feel many of us were unfairly insulted by Mr. S. in his refusal to accept our perfectly pristine and correct answers to his last debacle. Not a Royals fan, ron? Manhattan, KS, is actually lovely. It's the getting there from here that's hard (unlike this puzzle. . .). I did a turn of 180 degrees to solve this puzzle, besides the obvious one of reversing the letters. Speaking of long gone actresses, I wonder if anyone else here remembers Grace Sneer? I usually listen to the puzzle by podcast, since we usually run errands on Sunday, and don't often listen to the radio at that time, and found it no longer available in the US iTunes store as of this week. Anyone else experience this, and, if so, any thoughts? Sunday mornings at 6:40 a.m. have me listening to KCFR almost every week. Errands and swimming start later. I have not tried the US iTunes option. You can download the NPR app for iOS or Android, and the puzzle always one of the stories in the Weekend Edition Sunday program. When I went to the wikipedia list of famous television actresses I could sense spirits wafting about while The Zombies sang in the distance. It certainly made my heart grow fonder. Two obscure references to the fact that Eva Gabor is not listed on this wikipedia page for famous television actresses: absinthe, which makes the heart grow fonder, and "She's Not There" by the Zombies. A lot of work to say there is no there there. I was supposed to join my friends in New Orleans for Mardi Gras, but when I arrived they found me Absinthe. Turns out, her sister played his first wife in a movie about another relative. The opera Alcina features the aria Verdant Meadows. "Lovelier, tho" is an anagram of "Hooterville". Fun fact: Arnold Ziffel was trained by Frank Inn. Pàul, did that animal trainer drink from a Frank Inn Stein? Always interested in tapping local expertise. Skydiveboy, any thoughts on Alan Eustace's breaking of Felix Baumgartner's free-fall record? It certainly wasn't hyped nearly as much. Yes, I expected someone here would ask, and then I forgot about it. I only found out about it the following morning while reading the online version of the N.Y. Times. (An East coast newspaper of some note.) I began then to look into the story. At first I found little more than a few words along with a You Tube video that was nothing more than a few seconds of the take off and then the landing, (not a pretty sight) which they kept repeating until I became sick and puked all over my keyboard. I was curious about the freefall time record being broken. I suspected this guy must have utilized a drogue chute, which not only would keep him stable (do not think of horses here) in FF, but also slow his time in FF. I eventually did discover he did indeed use a drogue. It was stated he dumped (not that, dumped is our term for activation our main chute.) at 28,000 feet AGL. This is nonsense. It also stated his entire time from exit and landing was fifteen minute. In the immortal words of SNL, "Does not compute!" The main thing for me is that Felix is still the true FF record holder, because his was true FF, and not slowed down by a drogue. I have not gone back to see if there is more video, including the actual jump because I forgot all about it. It was hot hyped in any way, so it was a surprise. Why are you so down on using a drogue chute? Is using a space suit a cheat? After watching Felix spinning, it seems sorta prudent. Has anyone considered using something like gyro-controlled nitrogen gas reaction-control system thrusters on his hands and feet to stay stable, or would that be cheating, too? When Tandem skydiving first emerged in the early 1980's, it soon became very evident a drogue of some kind would be necessary to slow down the FF rate because it was about fifty percent faster than an average weight solo skydiver experiences in normal, stable position. At the beginning there were a few minor grumbles about it not being true FF due to the necessary drogue, but that quickly subsided when more skydivers got into Tandem training and had to experience what it felt like going so fast on one jump where the drogue deployment would be delayed in order for the candidate to experience what it is like. Kittinger also used a drogue on his high altitude jump because he was a relatively inexperienced jumper and it was feared he would become unstable in FF with the thin air. The drogue was used on this latest jump for the same reason. It was so stated the day after. It does not prevent the flat spin situation. In my previous post I am simply pointing out the facts as I am again doing now. I am amazed at all the secrecy surrounding this latest jump. Where are the videos of the actual FF? I would also like to see exactly what the drogue looks like. I would like to know about how many jumps this guy supposedly has. "Avid jumper" does not mean anything to me. There is also something that bothers me a bit about the way this jump was initiated. He did not jump, but simply released. Huge psychological difference! You must use a space suit in order to survive. It was originally reported he opened at 28,000 feet, which is ridiculous and I still wonder why he opened as high as is now reported. I do not think much of secrecy, or trust it. Eva Gabor / Rob a grave. Eva Gabor was in "Green Acres", which was anagrammed 3 times, in order by Planned Chaos as "scare genre", by me as "screen rage" and by Skydiveboy as "Grace Sneer". Skydiveboy responded to my post by reiterating his dislike of television (screen rage?). I responded to his post by asking if Grace was in "Deliberated", an anagram of "Eddie Albert", who was in Green Acres with Eva Gabor. On another front, I did not find a clue to the NPR puzzle in the Sunday NYT crossword, but there was one in the Merl Reagle. Clue 50 Across (a theme clue) read: "Horror host with a shovel and a brother named Rob". The answer was "Doug Graves", whose brother was presumably "Rob Graves", very close to half of the puzzle answer. I knew "Deliberated" had to be an anagram of something in the show, but did not discover what it actually was. Good hint. I have never heard of any actress named, Grace Sneer, nor have I heard of anyone else with that name, but I do know it anagrams to GREEN ACRES. I think that show is what Eva Gabor is most remembered for. I think I actually watched one episode once. Last Sunday I said, “I didn’t appreciate Blaine’s clue at first but now I do.” As in I can dig it. Will used this same actress in his July 6th puzzle of this year: the Garbo/Gabor puzzle. "A-ok" referred to the long A sound of the "E" in Eva. This puzzle gets my VOTE as easiest puzzle of the year for Blainesville regulars. > Turns out, her sister played his first wife in a movie about another relative. Blaine's clue: We might as well dig up some of our hints from a prior puzzle. One digs while robbing a grave, and the NPR puzzle for 2014-07-06 was Name a famous actress of the past whose last name has 5 letters. Move the middle letter to the end to name another famous actress of the past. Who are these actresses? My comment at the end of last week's thread: "Will seems to love puzzles of this sort, and we have had many closely related to it," a nod to the fact of the Gabor sisters. Finally got The Call this week! Talk to you all on Sunday! Are you taping tomorrow, or did they already tape it today? If tomorrow, are you going to use a drogue? Taping tomorrow at 12:45 EDT. No drogue. But they asked me to use a landline phone with a cord; i.e., a static line with no static on the line. jan, at long last! Accordingly, we will all be listening with acute attention. Have you thought of a question for Will? When it's all over and done you might be able to get a copy from NSA. Yeah, I think I'l going to ask him about the "coincidence" of the answer to the NPR puzzle appearing in the NY Times crossword so frequently. Fantastic news, jan-soon-to-be-lapel-pinned! Break a leg, but don't break a sweat. You'll do great. We all know you are one smart cookie who will not crumble. Jan, that is SO exciting! Please post a picture of the famous "lapel pin", when it arrives. Here's a picture I found of a previous winner and her pin. My hint: stare decisis ("precedent") refers to Eva Gabor being associated with a recent challenge. Congrats – you’ll do great! Several of us here have played on-the-air before. Can’t speak for anyone else but here’s what I’d suggest. Pick a quiet room with no distractions. Have an uncluttered place to write, a piece of paper and a pencil handy. Name a somewhat well-known TV and film actress whose roles date back to the 1980s, and who has a role in a current-release film, as a "Nancy Grace" clone. Put a B between her first and last names. Then read the result backward. The result will be what certain artists do? In about ten minutes, at midnight PST, I will post this week’s edition of Puzzleria!, with three freshly tricky puzzles that promise to be a treat. Nancy Grace? Sela Ward? Never heard of them. Where have I been all this time? Many years ago I had job doing demolition and site prep at the Westminster Hall and Burying Ground in Baltimore, well-known as the burial site for Edgar Allan Poe. One of our tasks was to remove the flagstones around Poe's marker, to replace those with bricks. I knew that bricks do best with a moderate sand bed underneath, so we started digging down. The historian came running over yelling "Stop!" It turns out that Poe's wife, Virginia Eliza Clemm Poe (and first cousin, they married when he was 27 and she 13) was later buried in a bronze casket very near the surface, exactly where we were digging. So I almost did rob a grave. In a sense their grave site is a "Tenants In Common" (TIC), so I always think of it as a very Poetic place. Lot of work just to get to that last line. The Poe girl could have been the victim of a grave mistake. It may have been a lot of work, but it was worth it, ecoarchitect. How was it being on Will call? I was nervous but it was fun. My wife listened in on another phone, and we both worked on the on-air puzzle. Got to hear a little (very little) back-and-forth between Will and Rachel before the actual taping started. ecoarchitect, Poetic justice or Poetic license? Well worth it either way. jan, how was the banter between Will and Rachel? And, did you ask them to please call me next?! 1. How many correct answers? 2. What is next weeks challenge? Is Poetic justice an early form of cryogenics? I suppose they license they were put in the casket. I'm groaning on your behalf. You know, ecoarchitect, given that Thanksgiving is coming soon, both you and I and a few others here could easily be on the Blainesville Groaning Board ;-). I'm not sure I've got next week's puzzle copied correctly, so I'm going to wait until tomorrow to make sure. But it seems pretty opaque. Only 370 correct answers last week, I think, which surprised me. I thought it was a pretty easy one. Next week's challenge: The challenge comes from listener Sandy Weisz of Chicago. Write down the following four times: 3:00, 6:00, 12:55, and 4:07. These are the only times on a clock that share a certain property (without repeating oneself). What property is this? At the risk of another parachute pun, you're an early riser! It was the yeast I could dough. Whoa, jan, you were quick on those! Favorite Secretary of Labor, eh? Thanks for the shout out to Blaine's Blog. Jan, you did very well on what I thought was one of the hardest on-air puzzles in a long time. I only got two of them.